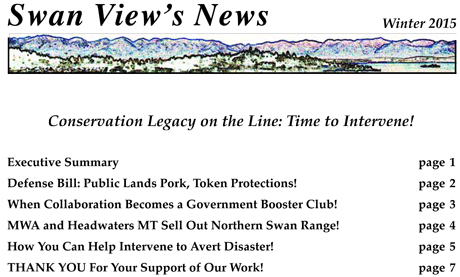 Our Winter 2015 newsletter outlines why we must intervene NOW to protect America’s wilderness and conservation legacy - and how you can help! 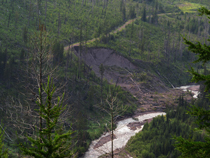 Montana Wilderness Association and Headwaters Montana are selling out wilderness quality lands in the northern Swan Range, an indicator of even larger problems in the conservation movement! This newsletter describes how bedrock environmental laws based in social justice, anti-materialism and public challenges to government are being sidelined and replaced by social favoritism, giving consumers everything they want, and paying any price for access to government officials. If you read only one newsletter in 2015, let it be this one! We need your help getting the conservation movement back on track! Click here to view or download our Winter 2015 newsletter. Please DONATE NOW to help us turn things around!